My name is Stella Sutherland (née Bouchereau) and I was born in London in November 1940. 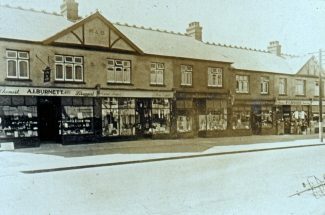 My parents moved to Benfleet in August 1940 to escape London bombing and found a flat at 4 Hopes Green [Photo 1], High Road, Benfleet. Mother had to go back to London to have me and my twin brother, Peter, as Rochford hospital in those days was an Institution. Our family, mum, dad, elder brother Eugene (Hughie) Peter and I then moved to Constitution Hill, Benfleet, where my younger brother Michael was born in l952. He still lives in the same house with his wife and grown up daughter Gemma. We all went to Benfleet Primary and at the time Miss Gale was Headmistress and Mr. Gardner Headmaster, then came Mr. Wood. Peter and I started in Miss Whites class, then Miss Davies, then Miss Webb. I myself then went to the top class and Peter was one below. I was in Miss Bass and then Miss Harrison (both P.E. teachers), then Miss Hall. From there it was Benfleet Secondary School (Now King John – Editor). My first teacher was Mr. Lower (Maths), then Mr. Bailey (English). I was top in English so was his favourite as the rest of the class said! He was a very nice teacher. Then Miss Elliott (P.E. ), she was lovely. I got on really well with her and Miss Pye (P.E.) because our whole family excelled in sport. Hughie was hurdles and high jump district winner and was asked by Geoff Dyson the Olympic Coach in those days, to go to London to train, but, being a very shy boy, he declined. He also trialled with Tottenham Hotspur but my father wouldn’t sign the forms for him to go on. The reason being he was doing an apprenticeship. Myself, I won district hurdles and high jump, breaking the ‘high jump’ record. I was also captain of school netball and rounders teams. Peter was very good at soccer and trialled with West Ham babes, and played in Germany, Holland and France with the S.E. Essex boys. Hughie and Peter still live in south east Essex with their families. I emigrated to Australia in 1970 with two children and had one here. Michael, who is 11 years younger, went to Benfleet Primary and then Rayleigh Grammar– he was the brainy one. Now retired at 65 he wins many prizes for his Dahlias and garden produce at Benfleet Horticultural Show. My best friend from King John’s (as it is now known) was Julie Grocott and we are still in touch. She lives in Gt. Wakering with her family. My twin brother’s best friend, Peter Brophy, came to Australia in 197l and we are best friends here. He lived in Melcome Road, off Kents Hill Road. I remember Michael Reed who I see on the internet. He was in my class at school and lived in the woods at the top of Bread and Cheese Hill. Fortunately I am blessed with a photographic memory for faces, he had beautiful eyes and long eyelashes which us girls liked, he was very quiet. Billy Kent and Olive Smith were head boy and girl in my day. I left King John in 1955 aged 15 years. Miss Boon was R.I. Teacher and Headmistress for girls. I remember lots of other teachers. At the corner of Constitution Hill was old Mrs. Hall and her son Henry, then came the library where Ken Deacon was Librarian. He lived with his mother in Kents Hill Road. Then a vacant block and Thundersley Park Road, on the corner of Thundersley Park Road was Smiths the Bakers, best bread ever. Then next door, a pet shop owned by Ashbys, their son Peter was in my class in primary school. Then Smiths woodyard. Cross over Grove Road to the Pumping Station run by Mr. Bowen. Going up a few houses then Mr. Garvey’s shoe menders shop, the shop next door was empty for a while until Richardsons furniture took over. Then a butchers, never went there, followed by Alden’s the undertakers. Mary Alden was in my class as was Angela Garvey. Then the haberdashery shop run by Mrs Duff whose daughter Diane was also in my class. 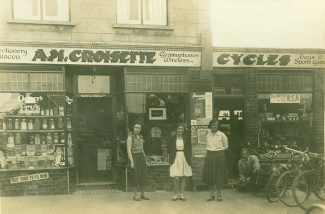 Can’t remember much about the shop attached to that as it was empty for some time. Then there was Searsons shoe shop. Up a couple of shops was an old antique shop for a while. Going up as far as Sweetbriar newsagent and confectioners, my old friend Barbara Reynolds and her husband took over that for a while before emigrating to Adelaide, Australia. Back down towards Hopes Green was the Co-op, then two houses (semis) then Mrs.O’Connors sweet shop next door to Green stores (food shop) then vets and upstairs my mum and dads old flat. 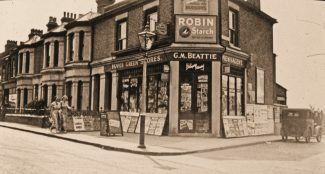 Then Newman’s shoe shop then Mrs. Lipley’s dress shop and next door on the corner of Brook Road was Beatties grocery shop where we did our paper delivery rounds from. Over Brook Road, further down, was the Barn Club men’s drinking club. 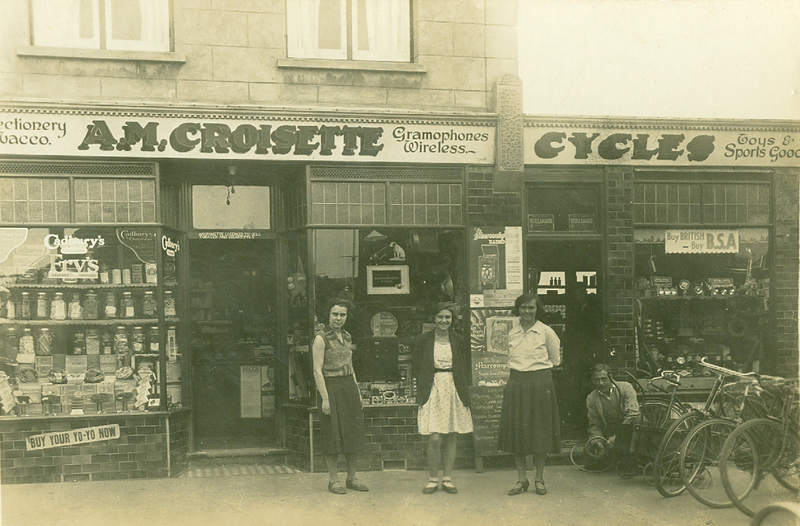 Then Foster’s bike shop, Eatons Greengrocers, Nunns butchers (Ian Barclays grandad). Ian was in my class at school, his nickname was Biscuits Barclay. Then Mr. Sharmans shop [Photo 2]. We were very friendly with him and his wife. Then a little secondhand furniture shop, then the sweetshop by the brook was Sinclairs. (Forgot to mention Albert Pratt’s off license opposite, 6d for a bottle of pop and 3d for a bag of Smiths crisps, 2d back on the bottle). Going on to Benfleet Primary School, next door old Mabel lived in her cottage, she was quite mad. Vacant land, then Scout Hall and Benfleet cadets. Then entrance to recreation field. 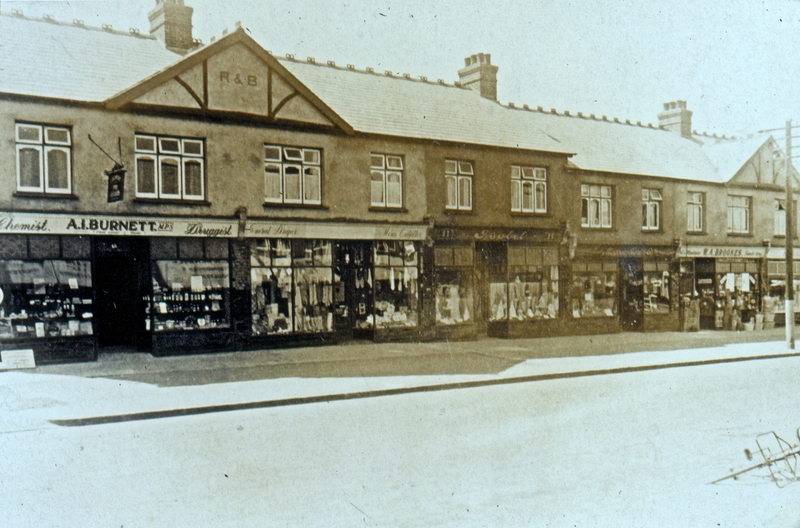 Burnett’s Chemists [Photo 3], Newman second hand shop (They later went down to Hopes Green, No.4, and had a shoe shop.) Then came the Post Office run by Mr. & Mrs. Drane, then Mrs. 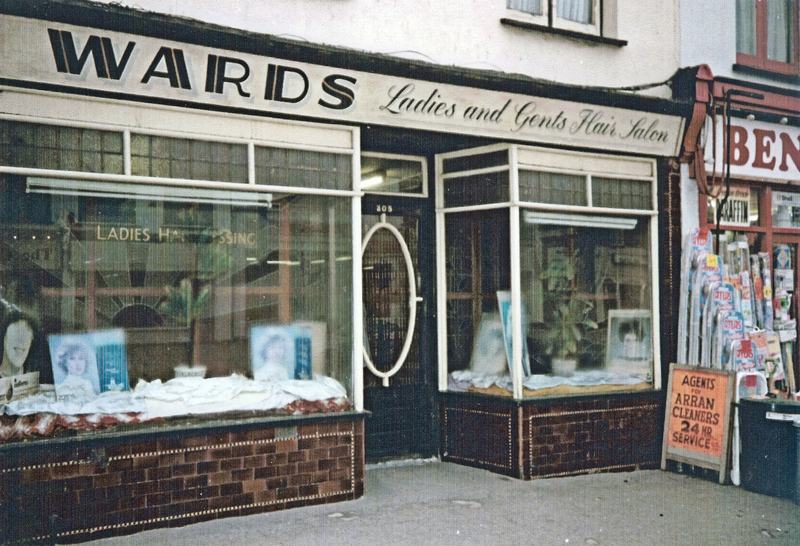 Wards hairdressers [Photo 4], then the oil shop as we called it, next door Howards Dairies Grocers, then Croisettes sweet shop [Photos 5 and 6]. Over the road up a bit was Doctor Tyndall, our family doctor, up a driveway. 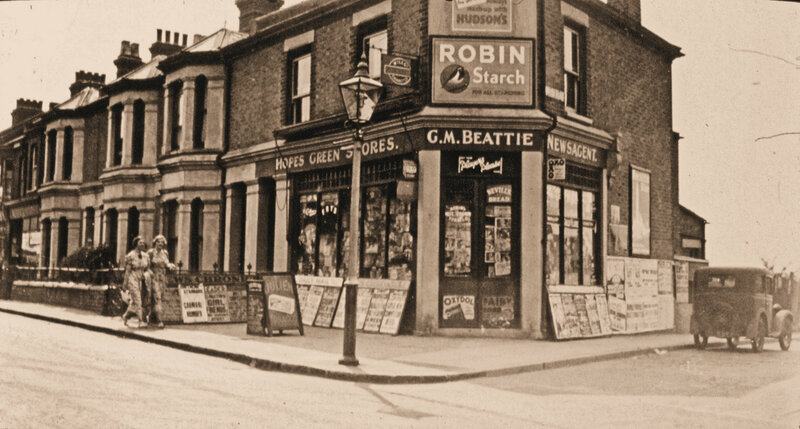 Rita’s hairdressers, then Sailsbury’s greengrocers. My elder brother was best friends with Lionel Salisbury, sadly he’s gone. 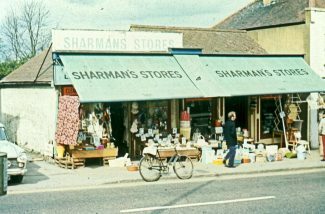 Then a small haberdashery shop run by one of the Searson shoe shop brothers, next door a garage, then Jordans small food shop. Croisette radio run by Roley and his brother had the sweetshop opposite. Then Mr. Coxshall’s wet and fried fish, the best fish and chips ever, and I have travelled. Sadly he died of cancer in his fifties and his daughter Thelma was in my class at school. 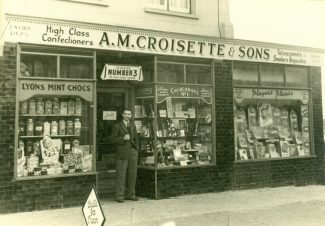 Then old Mrs. Knott and her son Alby had the grocers next door, we used to call it the ½ hour shop as she was so slow serving, but a lovely lady, after hours we could go round the back of her shop and she would serve us. Next door was Wrights the greengrocers, then Wielands the Butchers. A big house, then David Jeckll’s house and the Garage next to Kents Hill Road. We used to go to the war memorial on poppy day following the band. We would wait outside St. Mary’s Church to collect confetti after the weddings. My friend Mary Belgrove’s dad was publican of the Anchor. There’s so much more I can remember. I left Benfleet in 1961 when I married and moved to Seamore Avenue, Tarpots, then in 1966 we moved to Great Yeldham near Suffolk with my husband’s job and on to Australia in 1970. I have been back home for a few visits, the last one in 2013 to see my family. Sadly my husband has dementia and so I don’t think I will be going home again, very sad as I love Benfleet. So many wonderful childhood memories, sorry no photos 1, we didn’t own a camera in those days. I hope some of this is of use to you, I cannot rewrite as at 76 years the arm gets tired. PS Just reading a few more comments on Foley’s Toyshop and Barnes, they were further down. Couldn’t mention all that as it would turn into a book. I use to walk to an office near the Hoy & Helmet to pay the rent £1-2-6d a week at Cox & Coles, there’s more…..
What a lovely story, but I don’t remember your name, perhaps you were at the other end of the High Road and I was at the other end living with my parents Vic & Yvonne Barnes and sister Jackie too. Jackie was more your age, I was born in 1944. So lovely to read your story….